Has The Israeli-Palestinian Conflict Been Downgraded? : The Two-Way Forging peace between these two protagonists was long seen as the holy grail of American diplomacy. But as President Obama visits, expectations are low and the conflict feels much less urgent than it used to. With President Clinton presiding, Israeli Prime Minister Yitzhak Rabin (left) and Palestinian leader Yasser Arafat signed an interim peace accord at the White House in 1993. Twenty years later, President Obama is heading to the region with peace efforts in the deep freeze. Every American president since Harry Truman has wrestled with the Israeli-Palestinian conflict, to no avail. Yet they keep trying based on the notion that the Middle East will never be calm until there's peace between these protagonists. 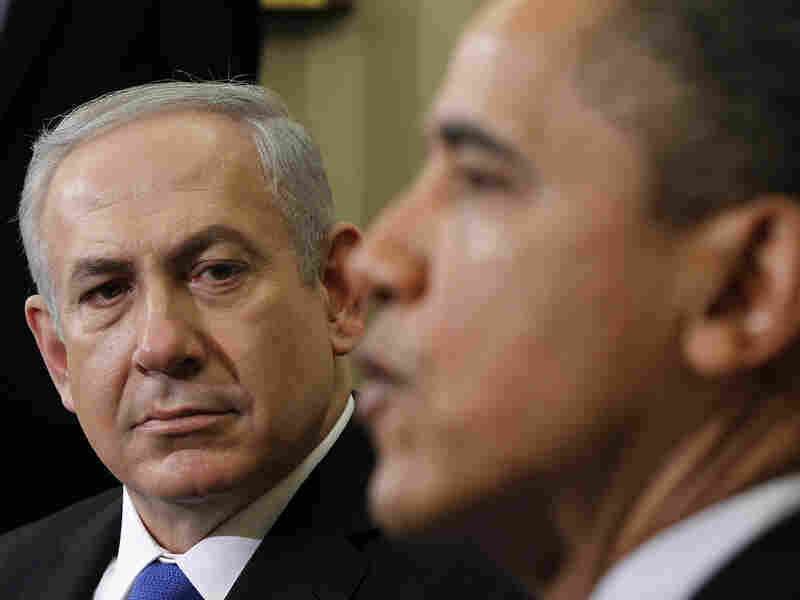 But as President Obama heads to Israel and the West Bank, expectations could hardly be lower. What's more, this long-standing feud, often seen as the holy grail of American diplomacy, no longer seems to hold the same urgency, according to many analysts. The U.S. goal remains a two-state solution that provides security for Israel and a state for the Palestinians. And a new round of fighting could reverberate throughout the Middle East. Yet for several years, the Israelis and Palestinians, long accustomed to center stage, have been a relatively quiet sideshow in a region going through dramatic upheavals. Egypt, Tunisia and Libya have all unshackled themselves from dictators but are still struggling to agree on a future. Syria's uprising, now in its third year, grinds on. No one can explain what's happening in Yemen. And perhaps the biggest challenge of all is Iran's nuclear program. Israeli Prime Minister Benjamin Netanyahu and President Obama are expected to talk about Iran's nuclear program when they meet Wednesday in Israel. The Palestinian issue is currently seen as a lower priority. The leaders are shown here at a March 5, 2012, White House meeting. "When I interviewed President Obama last year, I sat with him 45 minutes, and we didn't talk about Palestine," Jeffrey Goldberg, a longtime Middle East watcher at The Atlantic, said in an interview with NPR's Scott Simon. "The subject was Iran. That is the overwhelming issue for the Israelis at the moment. And it really is the No. 1 foreign policy challenge for the president. And what happens is that the Palestinian initiative sort of fades away," Goldberg said. "It fades in part because the Palestinian leadership is very ineffective. It fades in part because Palestinians are actually undergoing a bit of a civil war themselves." 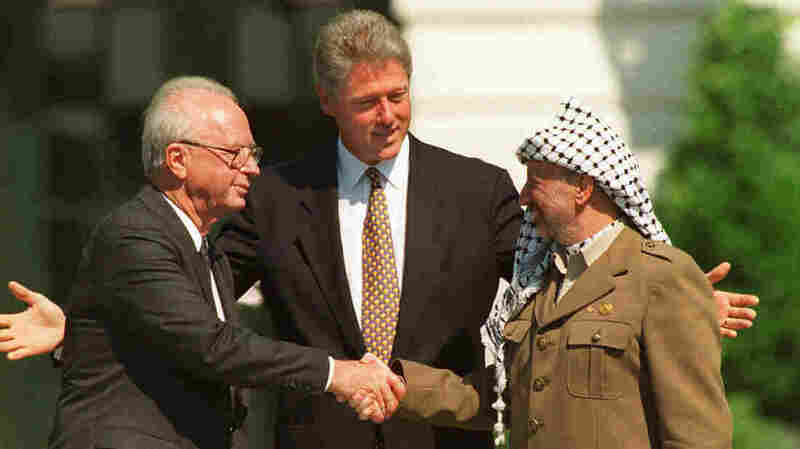 This year marks the 20th anniversary of the 1993 Oslo accord, signed on the White House lawn by President Clinton, Israeli Prime Minister Yitzhak Rabin and Palestinian leader Yasser Arafat. The goal was to permanently resolve the conflict within five years. But the talks failed, and violence erupted in 2000. The two sides have effectively retreated to their corners, with minimal contact aside from sporadic clashes in recent years. "Quietly, with nobody announcing it, the Israeli-Palestinian conflict has shifted from a necessity to a hobby for American diplomats," wrote New York Times columnist Tom Friedman, who has been dissecting the Middle East for three decades. "Like any hobby — building model airplanes or knitting sweaters — some days you work on it, some days you don't. It depends on your mood, but it doesn't usually matter when that sweater gets finished." So is this lower international profile a temporary lull or a more permanent condition? It's the Middle East, so no one knows. But there are several reasons to think this trend could continue on its current trajectory. -- Many Israelis look at the region's turmoil and say now is not the time to make major moves. Much better, they say, to let the new Middle East take shape before Israel commits to any big changes. Prime Minister Benjamin Netanyahu's new government, which was sworn in Monday, was born out of an election that focused on Israeli social issues rather than negotiations with the Palestinians. -- The Palestinians remain divided between separate West Bank and Gaza Strip leaderships. This split, now six years old, appears to be more entrenched than ever. And neither Palestinian leadership has been able to marshal the broad and sustained international support that the Palestinians need to put pressure on Israel. -- After two major U.S. wars in the Middle East, most Americans are showing no desire to plunge into another seemingly intractable Middle East problem. All of the current momentum is for the U.S. to be less not more engaged in the Middle East. -- The U.S. is steadily becoming less dependent on Middle East oil, and therefore the region is likely to play a smaller role in America's strategic thinking. Obama sent a clear signal last year when he announced that the U.S. would be directing more military, diplomatic and economic resources toward Asia. A decade ago, when the Israeli-Palestinian conflict was raging, you couldn't open a newspaper or turn on the television without hearing about the latest carnage. At the end of one long, exhausting and bloody day, Saeb Erekat, the longtime Palestinian negotiator, said, "Frankly, I think the world is sick and tired of the Israeli-Palestinian issue. I think they just want to see it go away." It seemed a bit odd at the time, when the region was awash with peace envoys and the story was a fixture in the headlines. Today Erekat's remark seems prescient. Greg Myre, the international editor at NPR.org, reported from the Middle East for more than a decade and is the co-author of This Burning Land: Lessons from the Frontlines of the Transformed Israeli-Palestinian Conflict.